You will need to associate a filtration system and a water treatment for the health and clearness of your concrete swimming pool water. Marinal concrete swimming pools integrate a filtration system but you will have to take care of your water with the right treatment. If you do not regularly carry out a disinfecting and cleansing treatment of the water, it can become turbid because of algae and be full of bacteria. Filtration is the first step to get clean pool water. The filtration pump is installed during the construction of your concrete swimming pool. It will take in charge the mixing and the full cleaning of the water. Once the impurities are removed from the water, it is appropriate to disinfect it and purify it. Even if you clean and renew it properly by filtration, the water of your swimming pool remains an environment conducive to the development of algae, micro-organisms and bacteria. To keep your pool water wholesome you can treat your water with chemicals such as chlorine, bromine, PHMB, or with salt water chlorination. The chlorine pool water treatment can either be liquid or solid. Chlorine eliminates bacteria and avoids the formation of algae. It allows a very powerful disinfection at a lower cost. However, the chlorine level of the water must be controlled, based on the water pH. The water pH is a key element for the effectiveness of disinfection by chlorine. You will easily find pH testers in the shops, together with chlorine water treatments. For chlorine intolerant individuals, you can use bromine. Bromine treats the pool water exactly like chlorine, by disinfecting it and by preventing the formation of algae. The effectiveness of bromine is also related to the water pH level. The bromine levels to be used depending on the pH are indicated on the products. Bromine does not have any smell, like chlorine does. However, it is more aggressive for the eyes and the skin and is more expensive. If you prefer to avoid chlorine and bromine and treat your pool water with PHMB, keep in mind that this product is a disinfectant and eliminates bacteria, but it will not prevent the formation of algae. Pool water treatment with PHMB does not have any smell. It is not irritating for the skin and the eyes, and there is no need to control the pH to use it right. However it is more expensive than traditional chlorine or bromine treatments. Furthermore, you will need to buy another product for the anti-algae treatment. The water treatment by salt water chlorination works by an electrochemical reaction produced by the electrolyser which separates the components of salt (chlorine and soda). Chlorine thus released plays its role of elimination of bacteria and anti-algae treatment. Afterwards, the salt gets back together again. The chlorine produced by the salt water chlorination is not irritating for the eyes and the skin, and has no smell. Nevertheless, chlorine affects the level of the water pH, which must always be controlled and restored if needed. The pool water treatment by salt water chlorination avoids the use of chemicals. It is an effective water treatment, rather expensive and which is not compatible with coating-like surfacings, like the ones often implemented for concrete swimming pools finishing touches. 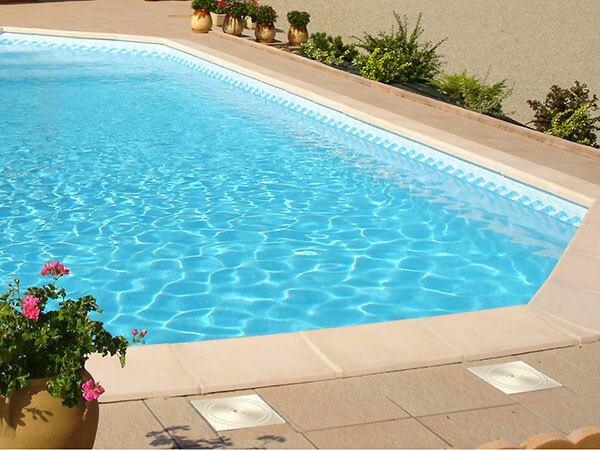 Your MARINAL specialist is at your disposal for any request of information about the maintenance of your concrete swimming pool and water treatment.